Launched in 2012, Windows 8 brings improvements in execution and ergonomics, and in particular creates a revolution in the computing world by its compatibility with touch screen devices such as tables, screens, laptops, tablet PCs, walls, etc.! 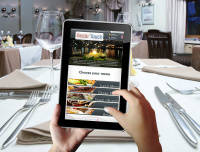 Presentation'Touch is a multi-touch and multi-user application to interactively present documents, videos and photos. Ecard'Touch is a multi-touch and multi-user application for Windows® 10, 8 and 7, Samsung SUR40 with Microsoft® Pixelsense™ Microsoft® Surface™ 1.0. Share'Touch is a collaborative multi touch and multi user application to instantly share, track changes, and much more in real time across any linked devices around the world. Share'Touch is a collaborative application to instantly share, track changes, and much more in real time across any linked devices around the world. Pong'Touch is an update of the family classic, for Windows® 10, 8 and 7, Samsung SUR40 with Microsoft® Pixelsense™ 1.0 and Microsoft® Surface™ 1.0. Sudoku'Touch is a multi-touch and multi-user Sudoku game on Windows® 10, 8 and 7, Samsung SUR40 with Microsoft® Pixelsense™ and Microsoft® Surface™ 1.0. Tic-Tac-Toe'Touch is a logic game played on Windows® 10, 8 and 7, Samsung SUR40 with Microsoft® Pixelsense™ and Microsoft® Surface™ 1.0. Race'Touch is a multi-user car racing game for Windows® 10, 8 and 7, Samsung SUR40 with Microsoft® Pixelsense™ and Microsoft® Surface™ 1.0. Paint'Touch is a drawing and puzzle game for kids, using Windows® 10, 8 or 7, Samsung SUR40 with Microsoft Pixelsense™ or Microsoft® Surface™ 1.0. Quiz'Touch is a multi-user trivia game for Windows® 8 and 7, Samsung SUR40 with Microsoft® Pixelsense™ and Microsoft® Surface™ 1.0. Planet'Touch is a multi-user educational game for kids on Windows® 10, 8 and 7, Samsung SUR40 with Microsoft® Pixelsense™, and Microsoft® Surface™ 1.0. 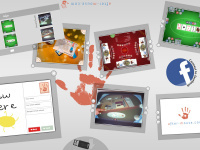 Casino'Touch is an interactive game of Boule for Windows® 10, 8 and 7, Samsung SUR40 with Microsoft® Pixelsense™, and Microsoft® Surface™ 1.0. Air'Hockey is a dual user multi-touch competitive game for Windows® 10, 8 and 7. Numbers'Touch, a multi-user educational math game on Windows® 10, 8 and 7. Shuffle'Touch is a multi-user educational word game on Windows® 10, 8 and 7. Shell'Touch is an app launcher to display your featured selection of apps in one unique interface, easy to use and showcasing your brand. Snap'Touch is an updated version of Memory Match for Windows® 10, 8 and 7. Shapes'Touch is a logic game for children on Windows® 10, 8 and 7. Curling'Touch is an updated version of the classic Shuffleboard game, for Windows® 10, 8 and 7. Puzzle'Touch is a new version of the classic jigsaw puzzle, for Windows® 10, 8 and 7. Match'Touch is an interactive matching game for Windows® 10, 8 and 7.